Living in an apartment, neutral coloured walls are more often the rule than the exception. But, that doesn't mean you can't enjoy a colourful apartment! We at Compten Management Inc, want our residents to feel comfortable expressing their own style. So, we've put together a few ideas to help you colour your apartment without hiring a painter! One of the easiest ways to bring in a little colour, is to add art to your walls. On a budget? Check out online poster sites for a wide range of genres and styles at reasonable prices. Once you choose a favourite or two, take it to have placed in a frame or set on photo-board for a professional finish. 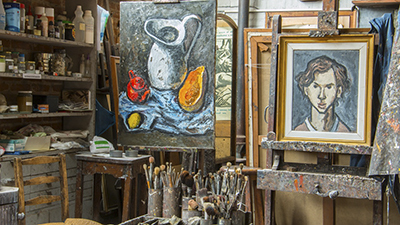 For an even more affordable option, make your own art by using your favourite paint medium and a canvas, paint frames for personal photos, or frame your favourite fabric. Tip: Renters who are worried about having too many holes in the walls can use 3M hooks instead. Don't forget you'll need to properly patch any holes in the walls prior to moving out. 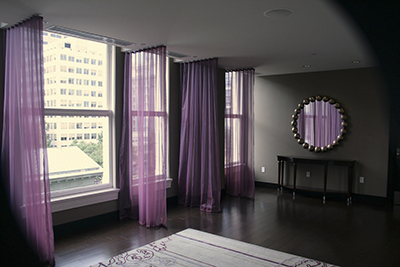 Hanging vibrant window coverings can effortlessly add colour to any room. If you love natural light in your home, try colourful sheer curtains and let the sunlight project the colour onto the walls. Brighten up your living space by adding vibrantly coloured or patterned throw pillows and blankets, or repurpose your existing pillows with new slip-covers. Be bold by adding an eccentric area rug- even if your space is already carpeted! Remember when choosing furniture, you don't have to always go with a neutral shade- using accent colours can be fun and make more of a design statement. For example, a blue kitchen table or red couch can add a unique focal point to your room. Additionally, colourful dishes and smaller decor items can add subtle hints of colour to a room, to accent your main colour choice. Plants are a great addition to any living space. 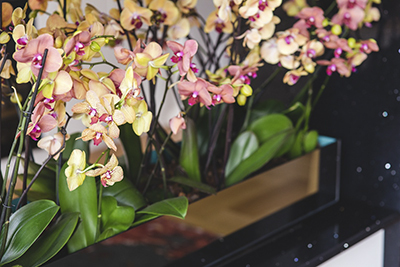 Plants with or without blooms add natural colour to any space. Some easy to grow plants include: Spider plants, Peace Lilies, Violets, Succulents, or Hibiscus. If you have the space, try indoor trees such as the Schefflera or the Dragon Tree, they are aesthetically beautiful and easy to care for. Don't fear neutral walls! Embrace them by choosing colourful accents and vibrant accessories. If you are looking for a new apartment, Compten Management has a variety of suites waiting for your splash of colour! Find your new home in Toronto or Mississauga today.